It is a nice comparative example! Okay. Today's topic is a Fallback Fonts. 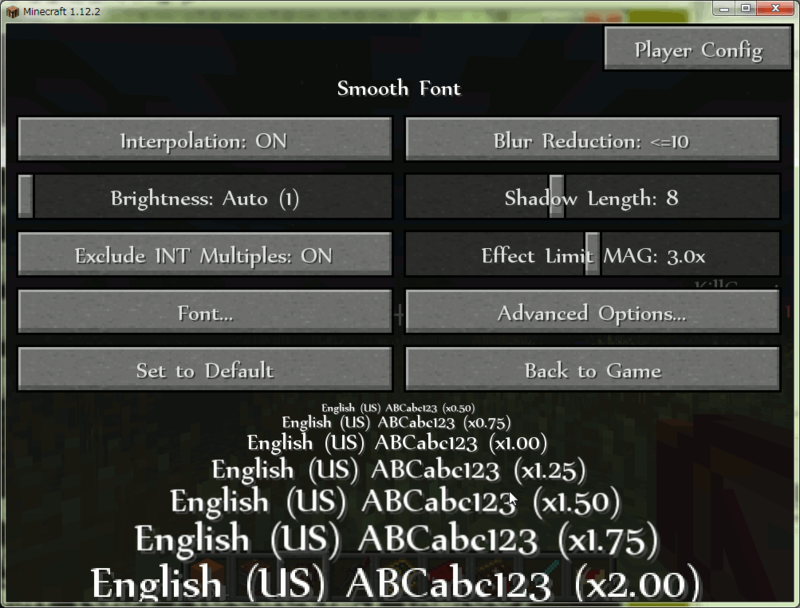 Either I'm not doing it right, or there's some issue between Smooth Font, Minecraft and InGameInfo. I'm trying to render moon phases as letters. I was half expecting that… still, thanks for confirmation! I have an odd request … Thaumcraft 4.2.5/MC 1.7.10. The text in the Thaumonomicon is… legible, but far from pleasing. I've been using UnicodeFontFixer before. 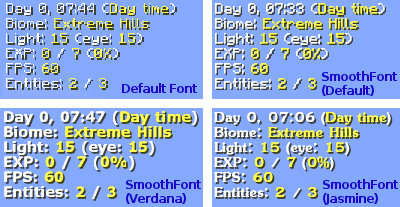 While not exactly "fixing" much of actual font rendering issues, it made most of the fonts actually readable and largely uniform. 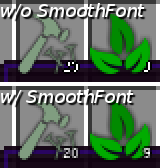 With SmoothFont, the situation is different. 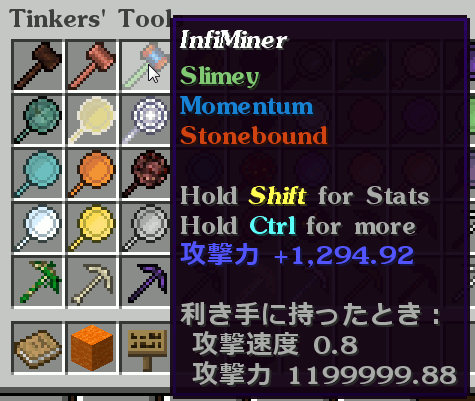 The UI is much better visible, most of the font scaling issues are alleviated by default, but Thaumonomicon stays jagged. Forcing LERP:ON makes it look better, all right. I'm not sure how it would interact with other mods, as I don't have time for extensive play sessions ATM. If you can do something about specific mods, like this one, it would be appreciated, I'm sure. "Force LERP" does not depend on a specific MOD and it is a very simple function. 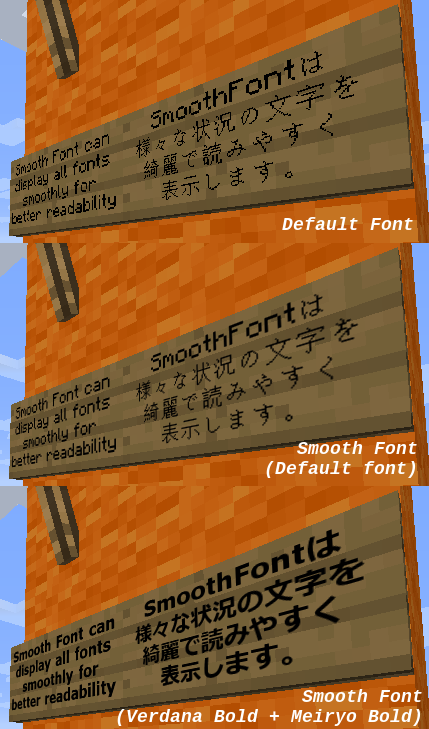 When loading unicode font textures, it is simply enabling a linear interpolation filter. 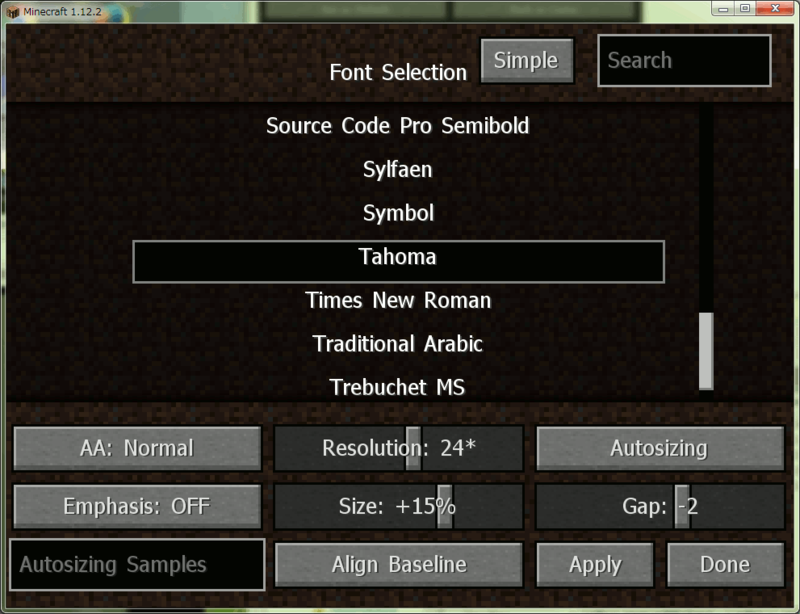 So even if the mod has an independent font renderer, the "Force LERP" is effective if a regular texture loading API is used. do you mean to or two as in two fonts are replaced in your computer? Is your question about secondary font? I will explain the secondary font. You can select two fonts from the fonts in your computer. One is the primary(main) font. Another is the secondary(fallback) font. Usually characters are drawn with the primary(main) font. But if the primary font does not have the specific character and cannot draw the character, the secondary font is used instead. 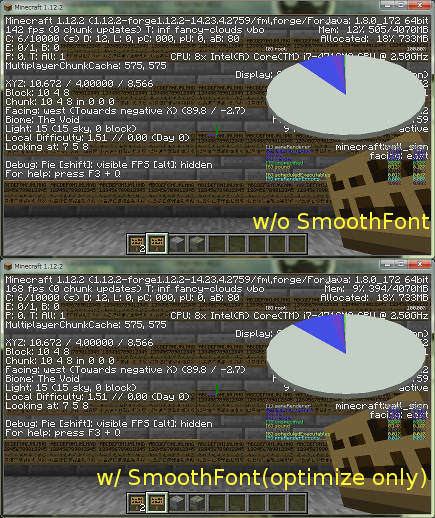 For example, if you set the primary font to Verdana font and set the secondary font Microsoft YaHei font, the english alphabet characters are drawn by Verdana font but the chinese characters cannot be drawn by Verdana font, so the chinese characters are drawn by Microsoft YaHei font instead. Another good example use case for fallback font is Open Sans Emoji to render these stupid symbols people are blabbering about. On a more positive note… http://prntscr.com/iosanh <3 Thanks! What I'd like to see is line height adjustment, if possible. I.e. DejaVu Serif Condensed is pretty much spot on to my eyes, but tooltips grow too high in many cases due to its rather generous vertical spacing. Yes, I agree with you. I'll investigate if line height can be adjustable. BTW, for DejaVu Serif Condensed, adjusting the font size to +15%~+20% seems to match the default line height as current workaround if you can allow larger font size. Thanks for the report. I uploaded the test version 1.11-alpha. Could you check if it is effective?